This week’s featured item is the Die Cast Imperial Cruiser. This isn’t just your average Die Cast Imperial Cruiser; this particular piece has the special offers that make this Cruiser extremely unique. Given an overall grade of 75 by DCA (Die-Cast Authority), this cruiser shows minor signs of wear. These 3 special offers are flashy and will help this Cruiser pop in your collection! Special offers were put on various vintage Kenner items to appeal to department stores from 1978-82. All of the special offers were very limited in release. 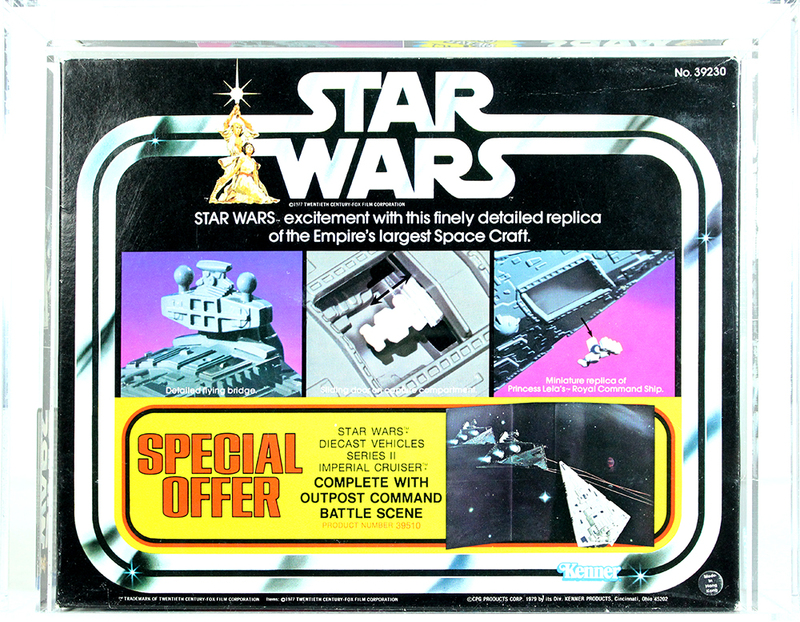 The special offer states “Complete with Outpost Command Battle Scene”. 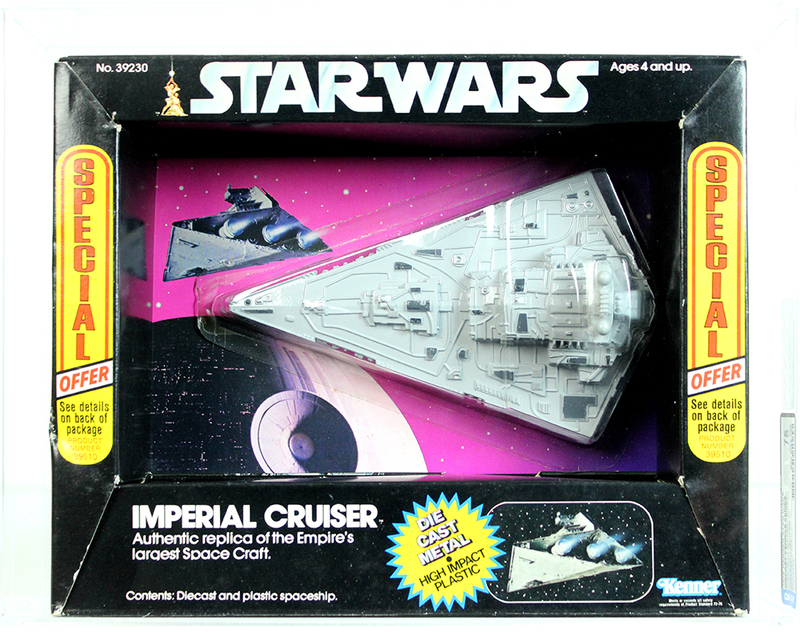 The fact that this Imperial Cruiser is still sealed with a special offer is astounding. How could you not open up this beauty and cruise it through the battle scene? A quick search on eBay shows very few of these special offer vintage items on the market, making this a hot ticket item! Next week I'll show you know about our twelve inch Chewbacca action figure in a rare Empire Strikes Back box. collecting community. 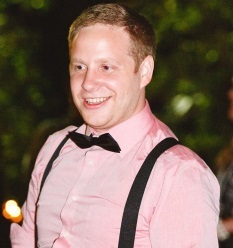 Check in for my weekly post about featured items, the collecting community, or Brian’s Toys news. We know how much customers enjoy specials and discounts. And one way to deliver those specials is through our email newsletter. But sometimes, we know you can't wait to see the latest product discounts. That is why we are trying a new feature that will hopefully make it easier for customers to browse all our specials at any given time. We have two brand new categories that will list products currently set at a discount price. One for Vintage Star Wars, one for Modern Star Wars. You can find these links by hovering over the Vintage and Modern category tabs, and you will notice that the links are at the bottom of the menu. Keep in mind that these categories will list products that are marked down from their original price. Most mark downs are temporary, so be sure to purchase the products before the sale expires! To make finding deals easier, we have added the long-awaited ability to sort products by either name OR price! Give it a try. NOTE: These coupon codes have EXPIRED. - For Orders Over $75 - Add over $75 of in-stock merchandise to your cart and apply coupon code OCT15OFF75 to save $15! - For Orders over $300 - add over $300, use coupon code OCT45OFF300 to save over $45. - Finally, orders over $500 - use coupon code OCT75OFF500 to save $75. There are certain restrictions that do apply. For instance, pre-orders and shipping are not applicable to the minimum order amount. The code is only good for new orders placed here. So while shopping, make sure to use one of the coupon codes and save! We are proud to announce the "Brian's Toys 12 Back Set Index" to reflect the retail value of the original 12 Star Wars action figures for toys in near mint to mint condition. The original total retail value of these 12 toys was $24.00, or $2.00 per action figure in 1978 and has grown to a retail value of $26,000.00 in 2014.